The objective of acquiring PL 217/2016 (Fig. 2) was firstly to explore for alluvial diamonds that are suggested to be present in palaeo-channels draining the diamond bearing kimberlites AK06 (Karowe Mine) and BK11. The present drainage is to the north, and based on geomorphological studies of the region and the occurrence of the diamondiferous Airport Pan gravels (APG) just north of the Orapa Mine (AK01) it is clear that the palaeo-drainage (post-Cretaceous) was also to the north. The alluvial potential has not been thoroughly tested in the Orapa area except for these APG north of the main Orapa mine. The second objective for acquiring this PL is the likelihood to discover other kimberlites using the latest geophysical technology. Both AK06 and BK11 have experienced some erosion from the upper part of the pipes. The weathered product of this erosion would have been released into these northward flowing palaeo-channels. This scenario, although not extensively explored in Orapa in detail nor in Botswana in general, is not unique in the Orapa area. 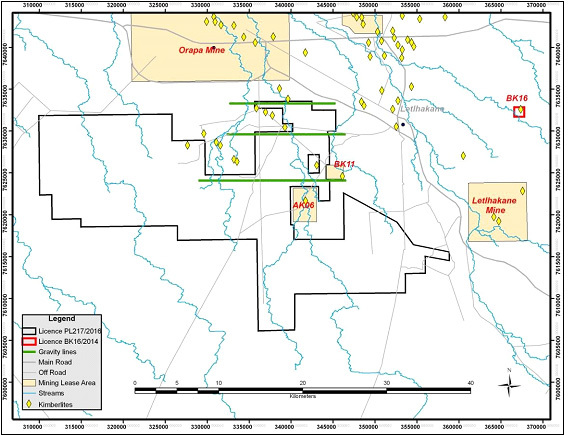 The AK01 kimberlite (main Orapa mine), a pipe that has experienced some erosion of the pipe and its surrounding volcanic cone has provided for a resource of well over 4 million carats in the palaeo-APG north of AK01 (Fig. 1). 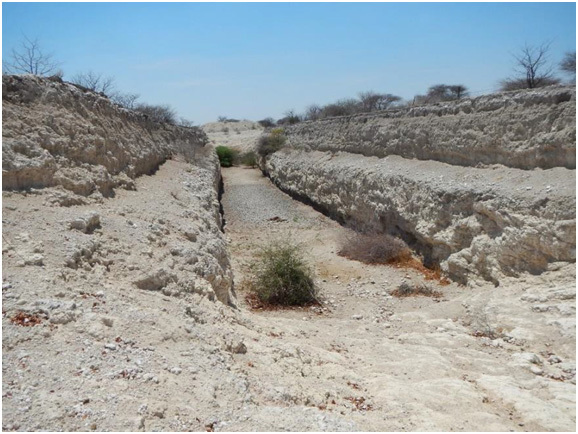 The gravels were deposits by north-flowing streams carrying diamonds from the AK01 pipe into the Makgadikgadi depression. Although this deposit was evaluated and a resource defined, it remains only part of the future mining plan. Likewise, the palaeo-drainage system over PL 217/2016 was to the north (Fig. 2) and the sediment infill of the channels are likely to contain diamonds derived from BK11 and AK06. The interest here in particular would be the large diamonds weathered out of AK06. These large stones would occur in the proximal reaches close to the kimberlite, much like the big diamonds, such as the Venter diamond (511 ct), that were found in the alluvials of the palaeo-Vaal River in South Africa close to the Kimberley mines. And as is seen in so many palaeo-alluvial systems diamonds are substantially higher in value in these secondary deposits, as the poorer quality stones are disintegrated in the transport process. Figure 1. Airport pan gravels, sand-dominated channel & bar system on footwall of karoo sediments / Kalahari silcrete. Clasts predominantly: silcrete, rare agate, fossil wood, basalt. Gravimetric surveys are used to locate buried bedrock valleys with infill of lower density materials because bedrock has a higher density than the unconsolidated sediment that infill bedrock depressions such as palaeo-channels. The difference in density of the two materials (an overburden-bedrock density contrast of 0.6 g/cm³ was considered appropriate) can be detected and measured geophysically using gravity-meters. Tsodilo Resources Limited used the gravity method to delineate paleo-channels (Fig. 2) on its PL, draining some of the diamond bearing kimberlites, like AK06 and BK11. Data was acquired at gravity stations 50 m apart along three east-west orientated transects perpendicular to the projected paleo-channels (Figure 2). The cumulative length of the transects is 44.1 km consisting of 881 gravity stations. Figure 2. Location of gravity lines (in green) relative to Karowe (AK06), BK11 and Orapa Mines (AK01). Known kimberlites are also shown as yellow diamonds. The north-flowing paleo-channels would have transported the erosional product from kimberlite pipes AK06, BK11, AK10 and AK09 towards the Makgadikgadi discharge area, much like the palaeo-channels associated with the Airport Pan gravels have taken diamonds from the Orapa Mine northwards. Although down-wasting of the land surface since the Cretaceous has been limited, the erosional product from this process would have been caught proximal to these pipes, as is evident from the diamond bearing Airport Pan gravels that are adjacent to AK01. A qualitative interpretation of the gravity profiles was made to map out possible channels. A total of four, possibly five, potential paleo-channels with tributaries have been identified (Fig. 3). Figure 3. 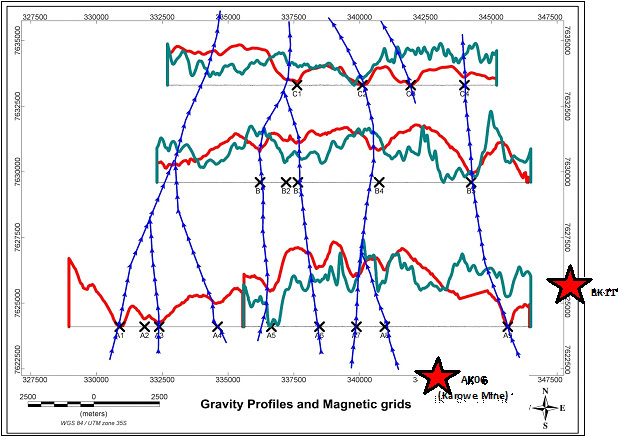 Profiles of gravity (red) and magnetics (green) along lines shown in figure 2. The crosses are possible channel incisions and the interpreted channels shown in blue arrowed lines draining northwards. Approximate positions of AK06 and BK11 are inserted. The next phase would be to test the projected channels in the most favorable positions using focused drill lines or shallow pits across each channel to confirm the position of the palaeo-channels and identify its infill. A method of using the analytical signal to identify magnetic anomalies due to kimberlite pipes was used to pick magnetic targets for further detailed work on PL217/2016. It is a pattern recognition technique based on a first--order regression over a moving window, between the analytical signal of the observed magnetic field and the theoretical analytical signal of a magnetic vertical cylinder. Results, were the correlation coefficient between the analytical signal and the theoretical analytical signal are above a certain threshold, are retained. Additional criteria such as the error between the model and measured anomaly, expressed as a percentage and amplitude of the anomaly, were used to further refine the targets. A total of twelve (12) targets were picked for detailed magnetic follow-up (Fig. 4). Figure 4. Eleven of the twelve magnetic targets were picked for detailed ground follow-up blocks. One target was adjacent to the Karowe mine and was not further evaluated. Background is the aeromagnetic analytical signal image with the positions of AK06 and BK11 marked. Two Cesium Vapor Geometrics magnetometers were used as rovers, traversing survey lines oriented in the north-south direction, spaced at 50 m intervals. The magnetometers were set in continuous mode, to automatically record magnetic values every 3 seconds. For leveling purposes, lines oriented in the east-west direction were traversed so as to ‘tie’ the regular lines and remove corrugations. A Proton Geometrics magnetometer was used as the base station, taking readings every 30 seconds. The Geometrics Magmap2000 software was used to download and convert the binary raw data to ASCII format. The software also performs diurnal corrections using data from the base station. In addition, the software is capable of performing de-spiking of bad data and low-pass filtering. The Reducedto Pole (RTP), Analytical Signal (Ansig) and First Vertical Derivative (FVD) transformations and filters were applied to individual grids and were sufficient to pick drill targets. Eleven of the 12 ground magnetic blocks, each measuring approximately 1 x 1 km, were followed up on the ground (Table 1), totaling 246 survey lines covering 258 km. 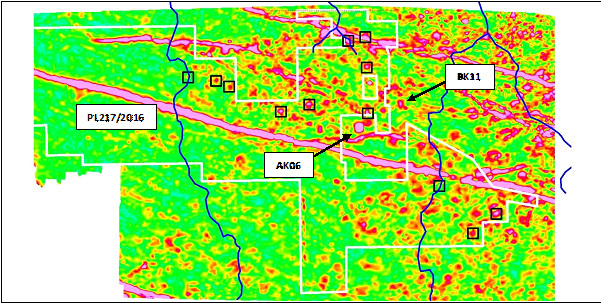 Magnetic target PL217_01 which coincides with kimberlite AK10 outside PL217/2016, and PL217_10, situated inside the Karowe mining lease, were not surveyed The RTP data, in conjunction with the FVD and Ansig data sets, were used to position drill targets to intersect the causative bodies. Examples of three of the targets are illustrated in figure 5. PotentQ software was used to model for depth, width, susceptibility and amplitude of each target. These data as well as the drill hole coordinates and modeling parameters, where possible, are summarized in Table 1. Targets have been prioritized according to their interest rating, 1 being the highest and 3 the lowest (Table 1). The next step is to drill all priority 1 targets. Should any of these turn out to be kimberlite all the other targets will also be drilled. Figure 5. Examples of some of the magnetic targets: PL217-02, PL217-03 & Pl217-04.